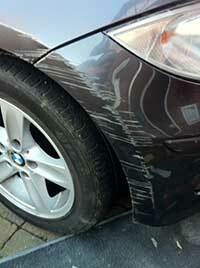 Smart Solutions is a car body repair service in Altrincham and the surrounding area. Our mobile repair service allows us to visit you at your home or place of work at your convenience, we also provide a collection repair service where we can collect your car from Altrincham and surrounding areas. We are competitively priced and ensure outstanding quality of work with every job. Our mobile repair service enable us to be around half the price of a normal car body shop with the same factory perfect paint finish. If you car has damaged scratched or dented bodywork the give us a call our mobile car body repair service is available anywhere across wWlmslow and the surrounding areas. Our small to medium area repair technicians can professionally repair your damaged paint to look like new, fully colour matched to your existing paint finish. For an a free paint repair quote please send us a picture and contact details.